During the glorious summer months of spontaneity and self-indulgence, dental health isn’t typically top of mind. Yet, with school right around the corner, parents and children have a to-do list, and dental care should be at the top of it. Let’s take a look at how children can ace their health report card, even before the first bell rings. There are many at-home habits that should be put into play to improve your child’s dental health. These best practices will in turn, help reduce the chances of cavities of other dental issues later on. Americans ranked hotdogs, hamburgers, ice cream, and ice tea as their favorite summer treats. Despite these American classics, parents should be cautious of their child’s food intake for the sake of their teeth. By simply packing smart-choice snacks and making healthier meals, children’s newfound adult teeth will benefit. Research from Colgate suggests that cheese, yogurt, celery, apples, and leafy greens can all help improve oral health. You may be familiar with the 3-2-1 rule of dental health. It states that you should eat three healthy meals, brush your teeth twice, and floss once a day. With long summer days, it can be a challenge to stick to a usual routine, however it’s important to remember that proper dental care is essential all year long. It is recommended for children to visit their dentist every six months. With their adult teeth claiming residence, you want to ensure that everything is progressing as it should. These regular checkups are typically covered by dental insurance. If you do not have a regular dental insurance plan, there are affordable dental plan solutions that can help you to afford these costs. It can be a good idea to schedule one of your child’s semi-annual dental exams in late summer after several months of binge-drinking soda and overindulging on candy. 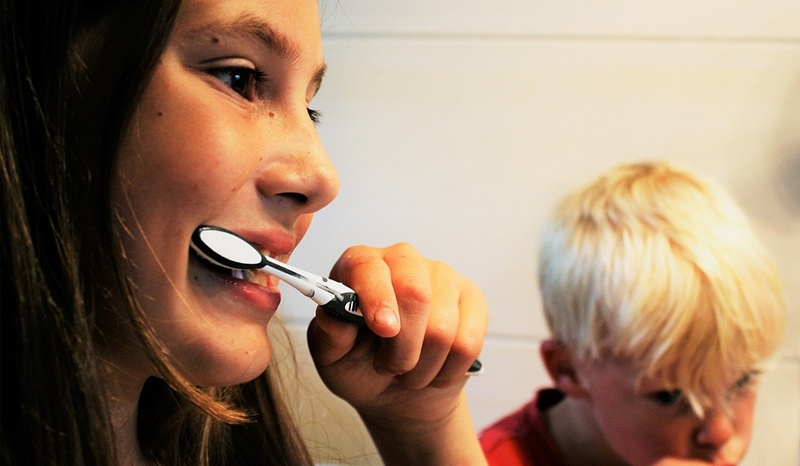 Some schools even request that children have an oral health review before school begins. With more than a quarter of preschoolers with visible cavities, more emphasis is being placed on children’s dental health. "With long summer days, it can be a challenge to stick to a usual routine, however it’s important to remember that proper dental care is essential all year long." When going to the dentist, it is essential to not only get a cleaning but also a complete oral and dental exam. Having teeth professionally cleaned regularly is key in overall mouth health, and regular exams can alert you to any problems before they become too serious. This is the time for your child to also mention any aches or pains they have been experiencing. An x-ray may be needed to investigate any issues or problems. A major part of dental health is investing in your teeth — even if they seem perfect. Adopting certain precautions can go a long way in protecting those pearly whites. According to the American Dental Association, over 200,000 oral injuries are prevented each year thanks to the use of mouthguards. If you know that your child will be participating in sports in the upcoming year, for example, a mouthguard can be a sound investment. Sealants are a thin protective coating that is applied to the surface of teeth. This plastic shield drastically decreases the amount of food and bacteria that settle into the cracks of teeth. This barrier results in an 80 percent decrease in cavities. It is suggested that children complete this dental tactic as soon as their permanent molars grow in. It can be quite simple to ace dental hygiene. By adopting recommended routines, having regular checkups, and following preventative measures, your child will go back to school with a Grade A smile.